The Tilt Blurb Divi Module is a custom Divi Blurb Module featuring a Tilt Effect with 3D Style customizations. 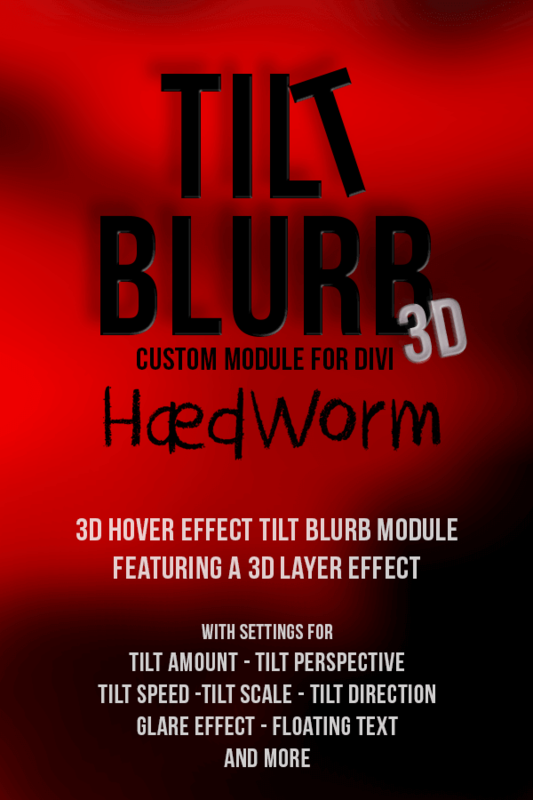 The module includes all the settings of the standard Divi Blurb Module and adds settings to adjust the tilt effect in a number of ways to allow you to create some unique effects for your images. You can adjust the Tilt Amount, the Tilt Perspective, the Tilt Speed and Scale just like the Tilt Image Divi Module but with the addition of a Glare Effect and an adjustable ‘parallax‘ type effect which makes the Blurb Content ‘float‘ above the background. There’s a whole lot more to the Tilt Blurb Divi Module, including the ability to ‘fix’ the Blurb Size using a hidden image so no more messing with padding to show the background image at it’s full size. Although a somewhat misleading description, the Tilt Background when enabled adds a new ‘3D’ layer to the Tilt Blurb that can sit behind or in front of the Blurb. Use it to create more depth to the Tilt Blurb or to create some interesting effects as you can see in the Demo. The Tilt Layer effect allows you to add up to 50 duplicate layers (multiples of 5) that sit behind the main background. These can be an image or a solid/transparent color, or both! This can give your blurb background a solid 3D effect. The script used for the Tilt Effect is called ‘vanilla tilt’ which is a forked version of tilt.js. It’s a very lightweight script that weighs in at just 4.5kb. All the other effects in this module use HTML/CSS so despite the vast features the plugin remains very lightweight. Please bear in mind that the Tilt Layer effect can have an impact on performance when using transparent .png images and semi-transparent layers so do be conservative when using these types of images with this effect. Install and activate the plugin just like any other WordPress Plugin. Once installed and activated the Tilt Blurb Module will be available along with the Divi Modules for the standard and speciality sections when you click the Insert Module(s) button in the Divi Builder. Add the Tilt Blurb Module to your layout. To enable and adjust the Tilt Effect click the Tilt Settings Tab and then click the ‘Use Tilt Effect‘ Toggle switch to the ‘Yes‘ position and adjust the settings accordingly. The additional settings for the Tilt Background and Tilt Layers can be enabled with the relevant Toggle Switches. To enable the fixed size background, click the ‘Size with Image’ toggle switch in the General Tab under the Image & Icon heading and add the same image there that you’re using for your background image. It seems this plugin doesn’t work at all with the tilt effect on Safari. Works just fine on Chrome and I haven’t tried on other browsers, but on Safari it goes totally wonky. Hi Jesse, sorry to hear you’re having issues. an you tell me which version of Safari you are using and which device and OS version? I’m using the most current version of Safari. So 11, on a MacBook Pro on os High Sierra. I should also mention that the demo version of tilt blurb on this site displays properly. So it must be something with my setup. I just installed the plugin normally though and am using the latest version of divi. Are you aware that the plugin demo crashes mobile browsers? I understand the hover effect not working on mobile but crashing iphones is disastrous. It happens when the large “TILT BLURB DIVI MODULE” comes into viewpoint. Hi Shaun, thank you for this. I was not aware although I was concerned about the number of effects I have on the demo page as they can be memory intensive when using lots of them on a single page. From my understanding, it is the use of opacity and shadows that use more processing power to ‘paint’;more so when combined with animations. It seems to vary across devices though I don’t think the larger effect should cause any issues on it’s own. I will split the demo page into multiple pages. I would add to this that it’s probably best to avoid enabling the tilt effect on mobile/tablet devices as the use of the tilt effect on touch screens is futile. Hi Samuel, that is correct. This is because the effect relies on mouse hover and there is no mouse or hover on mobile. The blurb will be visible on mobile, and there will be some limited movement ‘on touch’ but I think it’s best to disable it on mobile. Would I be correct in assuming this effect is absent on mobile? As Andrew rightly said this is currently not possible. As far as I am aware this is true of all third party Divi Modules at the present time. Is it possible to add/edit Tilt Blurb Module over Divi Visual Builder?